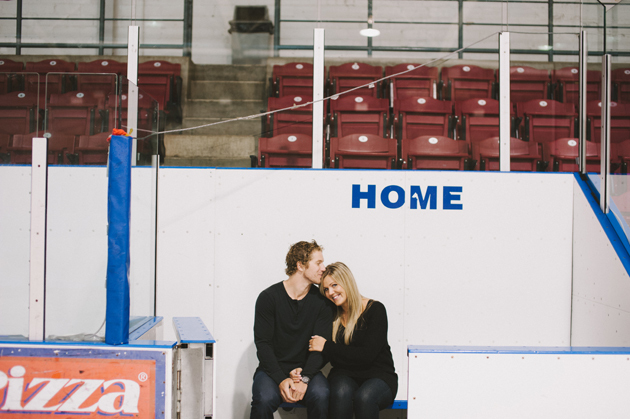 Let me start by saying that I love winter engagement photos. There’s something utterly romantic about cozying up at home with your bae during those cold winter months. 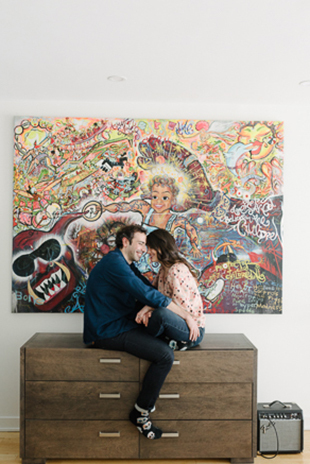 This is exactly what we wanted to do with Roxy and Daniel and shoot their engagement photos indoors. 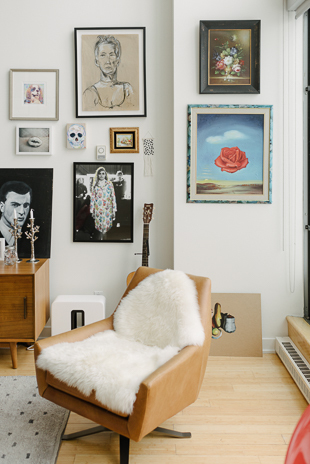 We imagined taking plenty of sweet and cozy pictures in their ever-so-stylish loft, interchanging between their minimalist bedroom and a colourful living room. However, we couldn’t resist peeking outside just for a few photos when it started snowing during their engagement session, and I’m so glad we did. Winter is also a slower season for us, your wedding photographers, and that is why we are filled with recharged energy needed to stay inspired. 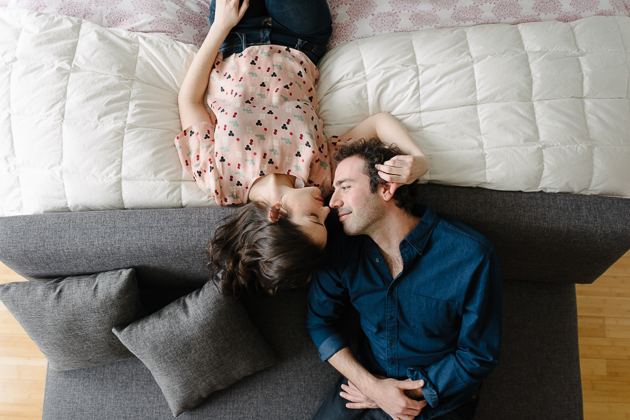 Winter is also a great season to reconnect with our couples and go over their future wedding plans. I always recommend my couples to schedule their engagement shoots in winter as it gives us plenty of time to get ready for your creative session, edit the photos and have them ready to print by the time your Big Day arrives. Where should I start describing Roxy and Daniel? 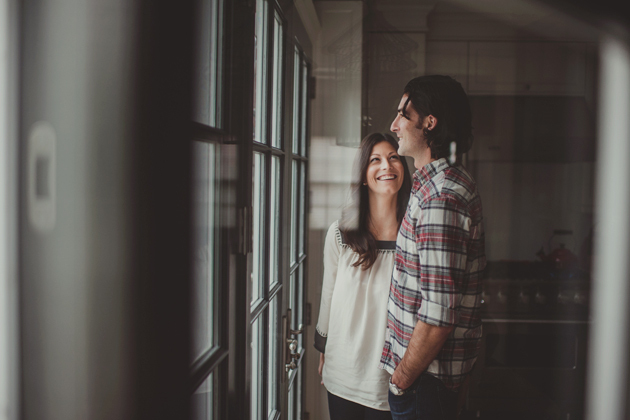 They are easily one of the most easy-going and relaxed couples out there. 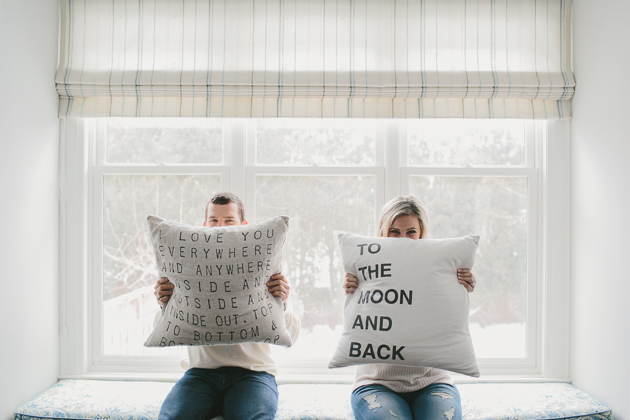 We have already shot their gorgeous Royal Ontario Museum wedding this year, and looking back at their engagement photos make me miss them so much! Daniel is such an all around nice guy, while Roxy’s warm smile makes me light up overtime I look at their photos. 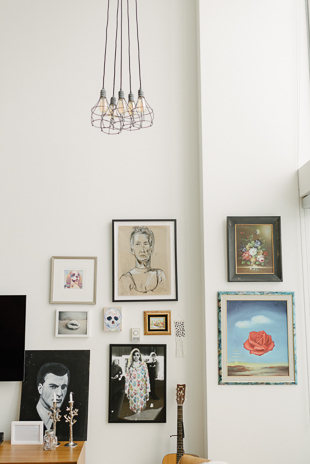 The two are really into music and arts, and capturing those artful elements of their home was so important to me. I also loved how laid back and chill the two were on the day of the shoot. I noticed that it started snowing outside on the morning of their engagement shoot, and when I texted them that it would cool to grab a few snowy pictures, they were all in. 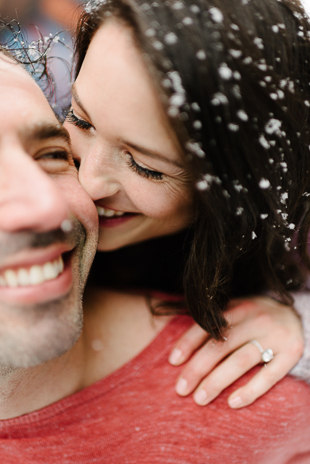 It turned out, these snowy pics became my all time favourite winter engagement photos! So here is a lesson. 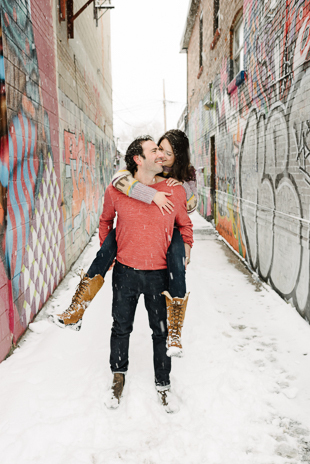 If you and your partner are enchanted with the wintertime, consider taking your engagement photos in the snow. While it might require some extra preparation (warm clothes, planning your shoot around the light, and avoiding major snowstorms), the end result will be absolutely worth it. I was wondering if you could send me information on engagement shoots and packages? I am looking for a holiday gift for a recently engaged couple.